Our main aim is to offer you the best and most luxurious way to experience a dog friendly glamping holiday. If you and your dog(s) choose to stay with us you can experience the great outdoors without compromising on comfort. Glamping holidays or “Glamorous Camping Holidays” offer you the experience of camping, the closeness to nature and freedom it offers, but with many of the creature comforts your used to; like en suite bathrooms with lovely hot showers, and luxurious beds! The Shepherd’s Hideaway, based in St Asaph in North Wales, offers glamping holidays with all those extra’s luxuries you’d really rather not go without. 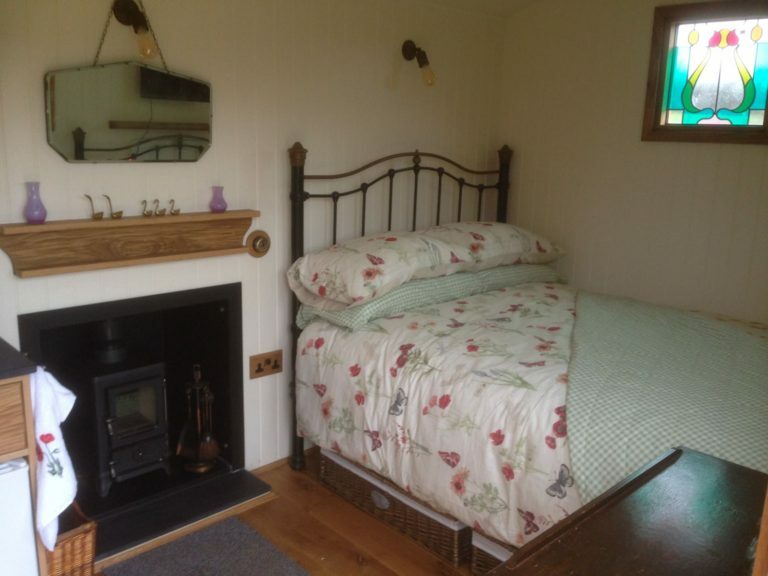 Our unique glamping holiday experience offers you the luxury of a Victorian cast iron bed, a fully fitted kitchen, a large wet room with shower and flush toilet and radiator. Glamping holidays wouldn’t be glamping without a real fire. 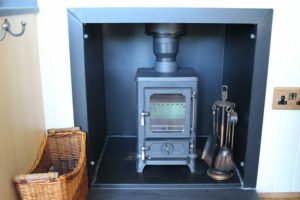 That’s why we put a Little Hobbit wood-burning stove in the Shire Hut. But as we are aiming to provide you with a luxury glamping holiday you don’t have to go out and chop the logs yourself you’ll find them free of charge in the log store alongside your very own shepherds hut! As we provide pet friendly glamping too where better for your dog to curl up in front of on a Winters night. 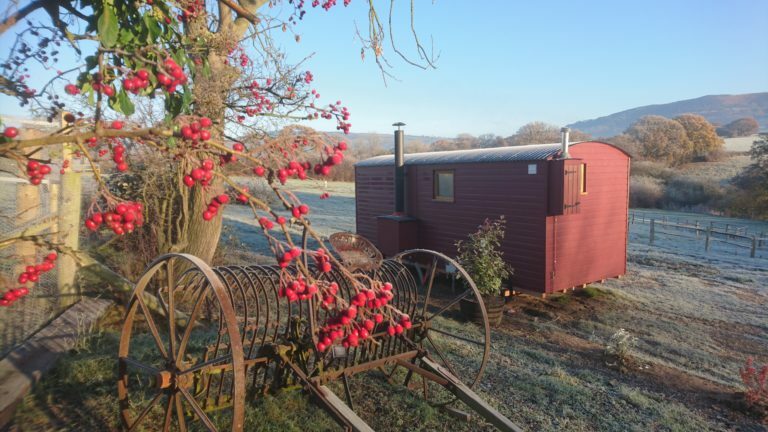 Our glamping holidays in North Wales mean that while you are in the middle of a field there is no trampling through mud because you have a car parking adjacent to your shepherds hut. So don’t rough it, come a have a taste of luxury glamping in North Wales. Bring your horse and your dog too! If you fancy a glamping holiday and you want to bring your horse and your dog then we can even accommodate that! We have out own horses too – If you just fancy being surrounded by beautiful animals!